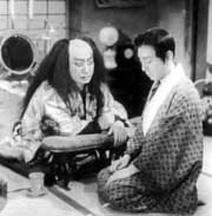 In Japan during the pre-WWII period, censorship was strict and supplies were limited, so filmmakers were urged to return to older, established plays from the classical Japanese theatre to invoke a strong sense of tradition, and also save money by relying on simple sets and stage actors who were used to playing the roles. Kenji Mizoguchi’s career had suffered under these conditions and he left his company for Shochiku after making two commercial failures (The Song of the Camp and Ah, My Home Town, both 1938). Suffering from depression and a lack of confidence, this was a critical moment in Mizoguchi’s career. But, as it turned out, a brilliant piece of inspiration produced what is arguably his greatest film of this period, The Story of the Late Chrysanthemums. The Kabuki Theatre had always had a very strong influence on the Japanese cinema. In some ways the early silent cinema in Japan suffered from the same ties to the theatre that many western films experienced. In his introduction to Japanese cinema, Donald Richie writes that “from the first the cinema was regarded as an extension of the stage” (2). Of course, close-ups and other techniques were employed, but the style remained primarily theatrical. Mizoguchi was already beginning to challenge this structure through his major works of the 1930s, and perhaps his move to Shochiku was partly due to a desire to continue to experiment. When casting began for the film, Mizoguchi demanded that a 40-year old, Shotaro Hanayagi, play the lead role. Mizoguchi felt that Hanayagi’s experience in the theatre was necessary for the long takes he was planning to utilise. Trouble was, the lead character was supposed to be in his early twenties. Kabuki actors are nothing if not versatile, but no amount of make-up would keep any close-up from being a dead giveaway of the actor’s age. So, as Macdonald notes, “Mizoguchi decided to rely on the long-shot taken through a wide-angle lens… [and] this almost accidental solution to a problem helped change the very foundation of Mizoguchi’s art” (3). The long takes avoid the theatrical method of directing the audience’s attention to particular parts of the stage/screen, while the wide-angle and its ensuing depth further distances the audience from the characters. In the process, the representational aspect of the action is blurred and, as Kirihara puts it, denies “the recognizability of the object” (4). The actors are also very often blocked from plain view, either by other actors or by material objects, such as a pillar or the walls of a room. The scenes in the Kabuki theatre themselves challenge this same notion by using quick cuts between different perspectives, not the standard positioning of the camera from the perspective of crowd often used to film plays being “acted out”. Kirihara notes that the film as a whole has an average shot duration of one minute while the Kabuki sequences have an average shot duration of only 18 seconds (5), leaving the traditional Kabuki acting, for which Hanayagi was chosen, for scenes away from the theatre, and transforming the Kabuki sequences through a montage-style that negates much of the scenes’ theatricality. In her book The Waves at Genji’s Door, Joan Mellen asks how it was that “Mizoguchi [was able to accomplish] so brilliant a tour de force in the same year that Ozu was censored for having his characters eat green tea over rice rather than a richer substitute” (6). Mizoguchi knew better than to explicitly satirise his characters and their society. Instead he weaved his criticisms into the technical make-up of the film, and beneath the censors’ radar. The unbalanced shots and obstructive objects suggest a society with a tradition of inequality as well as the obstacles which an actor must overcome in order to succeed independently of his father’s fame. At the same time, this is a profound indictment on the state of cinema itself. But the way that Mizoguchi was able to interweave these two messages and, while doing so, revamp his cinematic language and style makes this an essential film, not just in his career, but in the history of cinema. Keiko McDonald, Mizoguchi, Twayne, Boston, 1984, p. 57. Donald Richie, Japanese Cinema: An Introduction, Oxford University Press, New York, 1989, p. 8. Don Kirihara, “Kabuki, Cinema and Mizoguchi Kenji”, Cinema and Language, ed. Stephen Heath and Patricia Mellencamp, AFI, Milwaukee, 1983, p. 104. Joan Mellen, The Waves at Genji’s Door, Pantheon, New York, 1976, p. 160.